In season now, these little artichokes are a treat for artichoke lovers and a lovely shade of vegetable for Easter dinner. 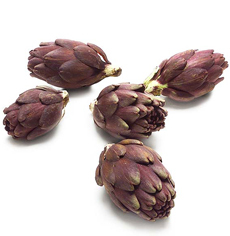 Called fiesole (fee-YEH-so-lay) in Italian, the baby purple artichoke—the size of a large egg—belongs to the botanical genus and species, Cynara scolymus, which includes the green globe artichokes and purple globe artichokes. Artichokes are the immature flower heads of an herbaceous perennial thistle plant in the Compositae botanical family. The cardoon, or artichoke thistle/wild artichoke, is a different species: Cynara cardunculus. Here’s more about artichoke varieties. The tulip shaped baby purple artichokes have the same great flavor as their large green and purple kin and are easier to eat because they haven’t developed the fuzzy portion of on top of the choke. They are bright violet in color; the colors fade only slightly when they are cooked. The only thorn in the flesh is exactly that: The leaves still have sharp tips. Baby purple artichokes. Photo courtesy Melissas.com. Harvested young for tenderness and rich flavor, baby purple artichokes typically have intense fruity and nutty flavors and grassy tones, and are considered to be the most flavorful of all baby artichoke varieties. If you can’t find the artichokes locally, you can buy them from Melissas.com. Look for firm, thin, compact leaves (called a tight core) that are bright without discoloration. If you squeeze the artichoke and it squeaks, it is fresh! Store them, unwashed in a plastic bag in the fridge for up to two weeks. Here’s a photo spread on how to prepare artichokes for cooking. Artichokes pair well with both fatty and high acid ingredients: anchovies, bacon, basil, butter, cheese (especially goat and feta), cream, garlic, lemon, hollandaise, mushrooms, pepper, sausage, thyme, tomatoes, vinaigrette, white wine and truffles. Appetizer: Simmer in olive oil, then fry at until ther leaves open. Sprinkle with fresh lemon juice and serve. Main: Slice in half and braise the artichokes in olive oil, white wine, garlic and herbs. Serve them with risotto. Artichokes were first cultivated in the Mediterranean region thousands of years ago in Maghreb, the region of North Africa west of Egypt, where they still grow wild. They spread through the Mediterranean region. The Greek philosopher and naturalist Theophrastus (371-287 B.C.E.) wrote of artichokes being grown in Italy and Sicily. The Greek physician Pedanius Dioscorides (40-90 C.E. ), a surgeon with the Roman army of Emperor Nero, wrote about artichokes at the time of Christ. Ancient Greeks and Romans considered artichokes a delicacy and an aphrodisiac. In the ensuing centuries, they were grown in France and other areas of Europe. In America, Martha Washington’s Booke of Cookery contains a 17th-century recipe entitled “To Make Hartichoak Pie.” In the early 1800s, French immigrants settling in the Louisiana Territory planted artichokes. Fiesole artichokes are named for the city of Fiesole, Italy, an ancient Etruscan town located in the hills above Florence. 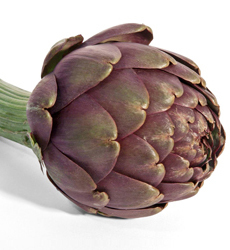 They were initially bred from the Violetta de Provence artichoke, a purple variety native to southern France. As for its botanical name, Cynara scolymus: The genus name comes from the Greek kynara, artichoke. Scolymus derives from the Greek word for thistle.